I like fishing the most! in the evening stage thing-comedy and talents. I even like the horseback riding! Mt. Borah just sent us our Team Strong Heart Kits today! Many thanks for our clothing sponsor for developing and providing all of our race jerseys and shorts. These fit and look great! Karen, thanks so much for all your work on the design! Now wouldn't YOU look good in one of these jerseys? You can order yours today! 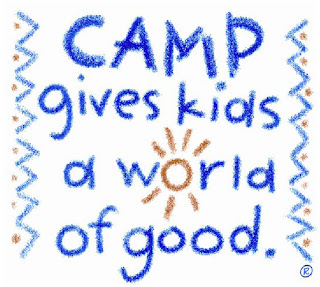 All profits go directly to Camp Odayin! A close third on the list of great things that happened on the May 12-13 weekend with Mother's day and the Fishing Opener taking the 1 & 2 spot (although some may argue the order), our pre RAAM rehersal really impressed us all! Left to right in the above photo: Greg Kostik, Timothy Case, Neil Eerdmanns, Bernie Kaeferlein, Jon Boshea, Mike Nelson, Bill Nicholson, Tessa Hart, Brendon Stefancic, Linda Bergstrom, Stephanie Wisnet and Angie Kostik [not pictured]. RAAM is not only physically demanding on the riders but is also physically and mentally demanding on the support crew. The logistics of getting 4 racers from coast to coast in the fastest time possible while ensuring the utmost safety is tremendous. Our team will use an XL motor home for crew and rider rest, and two minivans that will serve as a rider follow vehicle and rider support vehicle (takes the next rider up the road for the hand off). This is the "light" version of what some teams will employ to get from coast to coast. Some teams will use two motorhomes and 3 support vehicles but that takes no less than 12 crew members. Our goal is to use a strong and energetic crew of 8 to minimize costs and environmental impact (although the environmental impact is already significant!). I was really impressed how well all of us were getting along, working together and problem solving for just having met and being thrust into close quarters and stressful conditions. The weekend goal was to focus on the logistics of navigation, vehicle use and rider exchanges. Neil and Bill worked out a 110 mile loop in the rural farmlands northwest of the twin cities that were then loaded onto three laptop computers with GPS...one for each vehicle. The route was exceptionally hard with numerous turns and contained some new roads that were not accurately depicted on the GPS. We kept the exchanges short to maximize this training opportunity. We switched riders every 15 to 30 minutes and exchanged with the RV riders and crew every 1.5 to 2 hours. Initially, this pushed up the stress level while the crew learned to navigate and exchange. The riders learned proper exchanges and night rules. It didn't take long before things were running smoothly in light of a challenging course and a frantic pace of rider exchanges. The best part of the rehearsal was seeing the humor and compassion that the team demonstrated for one another. Mind blowing to consider that at the beginning of the day on Saturday, that was the first time most have met each other in person! We'll be adding more photos and video of the rehersal over the next several days. 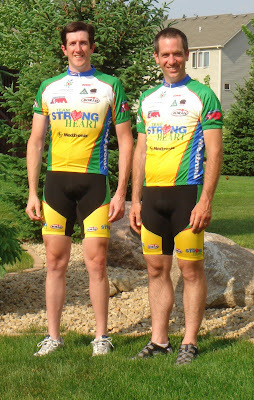 Check out Team Strong Heart Photos and Videos. Camp Odayin Article Appears in Congenital Cardiology Today! One of Team Strong Heart's key sponsors to promote awareness for Camp Odayin just published "Camp Odayin - A Camp for Children With Heart Disease" article in their May Issue! Click on the following link. The article appears on page 6. 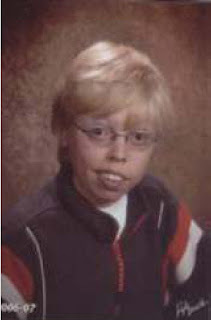 They have also graciously agreed to run advertisments for Camp Odayin for the remainder of 2007.